The Bai Ruttonbai Framji Dorabji Panday Girls’ High School is renowned for the education it imparts and highly respected for its clean and honest reputation, since June 1898. Today, we remember with gratitude and affection its great Founder, Sir Dinshaw Manockjee Petit, First Baronet and his family members who had the vision and foresight to build this institution for young girls and boys of the Zoroastrian community, especially those living within the precincts of the Marzban Colony and the Tardeo – Grant Road area where the School is situated, and especially for those who belonged to the weaker sections of society. The objective of the School has always been to give the children an all-round education, develop their personalities and encourage them to pursue careers of their choice. Several students have distinguished themselves over the years in their chosen fields. On 5th November, 1885, Sir Dinshaw’s young daughter Ruttonbai Framji Panday expired at the early age of 31, whilst giving birth to her fourth child, Meherbai – who herself was to become the mother of two luminaires: the well-known nuclear and space scientist, Dr. Homi Bhabha and Jamshed Bhabha, the founder of the National Centre for the Performing Arts. In her memory, Sir Dinshaw laid the foundation stone of the Bai Ruttonbai Panday Girls’ High School on 15th June, 1893. The school building was declared open on 5th June, 1898. The school was built in Gilder Lane in the midst of Murzban Colony under the auspices of the Garib Zarthostiona Rehethan Fund at the cost of ₹21,754 which included the cost of land measuring 482 square yards and costing ₹3,345 The “Nibhav Fund” of the School was started in the same year and ₹34,600 was collected from contributions by Sir Dinshaw Petit, his family members and other well-wishers. The late Dr Homi Bhabha was very proud of the School, and called it “my grand-mother’s school”. to set up a school within walking distance of the children’s homes in Tardeo which would give them a sound education. Therefore, on 7th November, 1885, on the day of the Uthamna ceremony of his dear departed daughter Ruttonbai, he put aside a sum of ₹22,100 to be used for the purpose of founding a school. This money was to form a corpus of the Garib Zarthostiona Rehethan Fund which was to manage the school. 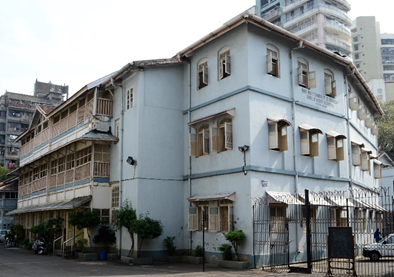 The school was then built and opened to Parsi girls of all ages and boys only under twelve years. It was then a Primary School with just 5 classes and 2 teachers. In those days, scant attention was paid to the education of Parsi girls. There was great opposition everywhere. Sir Dinshaw Petit’s vision was to educate the girl-child, make her independent and confident, at the same time prepare her to run a good home and be a good housewife. The subjects taught at the school were: the English and Gujarati languages, needle-craft, music, cookery, laundry, arithmetic, art — not forgetting physical education and indoor games. Avesta prayers and lessons from the Zoroastrian scriptures were also taught to the pupils. Additional rooms on the first floor of the school were built later from donations of ₹2,500 collected on the Uthamna ceremony day, that is, 6th December 1901, of Sir Dinshaw Petit 1st Baronet, by the three daughters of the Late Ruttonbai Faramji Dorabji Panday namely Bacchubhai Panday, Cooverbai and Meherbai. 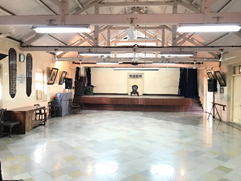 On 16th March 1928, the Hirabai Petit Hall of the School was inaugurated on the second floor of the building. As the number of pupils grew, need for extension was felt. Funds were raised with the help of a committee of able ladies to build an annexe building in 1966. 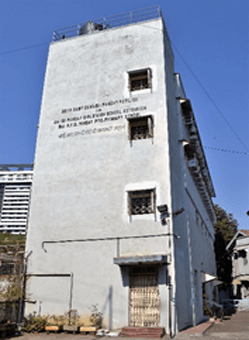 The building was opened under the title of ‘Seth Dady Cowasji Panday Pavilion and the Panday Girls’ High School Extension’. Immense contributions were made by Mrs Scylla R Vatcha and her family members. June 1975 was a landmark year when the school became cosmopolitan, after nearly 77 years of its establishment for Zoroastrian students only. Since 1898 the school has maintained its standard of imparting quality education to the girl child and has produced infinite number of fine young ladies who have excelled in their lives and careers.